UNIBOND is the replacement for the classic URAC 185. Most makers are still working from their own supply of URAC and have yet to experiment with other options. Jim Downes taught us to use URAC, obviously before it was discontinued. George and I have used tightbond, but I worry about the glues ability to withstand heat, and have heard it makes a softer rod than a URAC glued rod. George and I simply followed the mixing directions on the can. With no scale we measured by volume 6 tsp. of glue to 1 part of the supplied hardener. The glue mixed fairly well, I noticed some very small bits of hardener that no matter how much I stirred wouldn’t dissolve. These ‘bits’ of hardener remained white and were easy to locate if they were spread onto any of the splines. With the 6 to 1 ratio George and I had enough glue for two, two tip rods. The open time was enough for one man to spread the glue, carry the strips to the binder and one man bind. Our sections were then baked in the oven at 160 degrees for 1.15 minutes. The glue dried very similar to URAC. It was hard, but sanded off fairly easy. Even after kicking the glue in the oven we waited 24 hours to unbind and sand. The results were sections similar to URAC. So while a lot of makers continue to search for the next best glue we will stick with URACs replacement, UNIBOND. 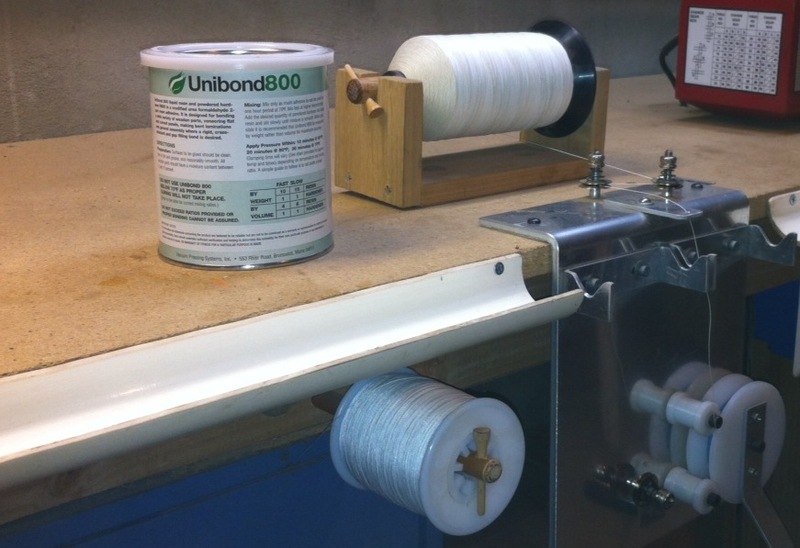 This entry was posted in Uncategorized and tagged Bamboo fly rod, glue, UNIBOND 800, URAC, URAC bamboo fly rod maker. Bookmark the permalink.